Corazon means heart in Spanish. Am I right? I discovered a place in Batangas called Casa Corazon. Hence, this explains the title. We have been having our annual spiritual retreat in Caleruega for three consecutive years. Everyone at the workplace loved it there. This year, we were surprised with a major adjustment. We will not be seeing Caleruega in 2013. 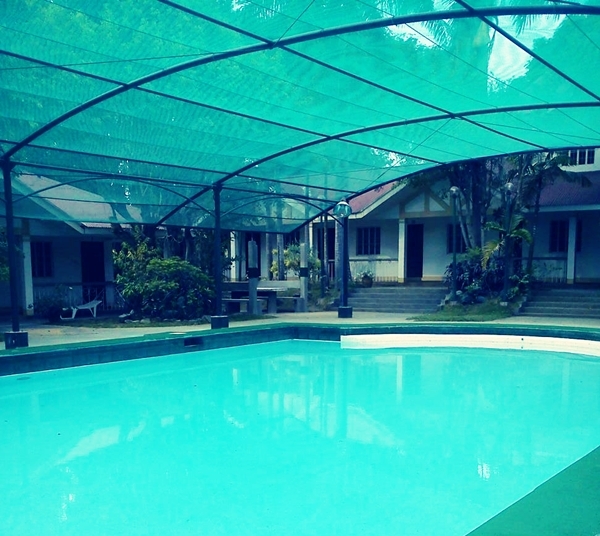 We were informed that we will be housed for three days at Casa Corazon in Lemery Batangas. It was my first time to hear the place. My instant help companion, Google! I searched for blog posts, reviews and prayed that the place maintains a website. I found a few reviews and pictures of Casa Corazon. One thing however surprised me, it was a resort. They have swimming pools and some recreation facilities. In my mind, the place may not be suitable for a spiritual retreat. We left Manila last Wednesday and as always, I love the long drive away from the city. Since we were heading to Batangas, we passed by Tagaytay. The view of the Taal Lake, pineapple fields, colder temperature, the lush mountains and the clear roads never fail to refresh me. We reached Casa Corazon in less than 2 hours. We were given our room assignments and a chance to explore the place. Let me tour you to Casa Corazon through pictures. This is the reception area and office of Casa Corazon. It's a residential site that was turned to a museum and office. The house looks modern from the outside. Wait until I give you a virtual tour of the owner's place. Inside the house are antique wooden pieces and a lot of vintage mirrors. The house literally has mirrors everywhere. Let's move upstairs! I love the stained glass window that illuminates the staircase. Though some of my friends would tell me that it looks like a piece from an old church. The classic chandelier also contributes to the place's antique atmosphere. A living room welcomed us in the house's second floor. Can you see the picture frames from the left? I would like to believe that they are the ancestors of the resort's owner. We were frightened by the vintage photos but during our free hours, we spent most of our time in the living room. Wifi signal is strong in this area (haha) so never mind the creepy feel. Here are more interesting pieces in the living room. A mah jong table also rests in the living room. Look at the intricate carving details of each chair. Another detail to love! The living room's center table is supported by a heavy metal carving. Classic hardbound law books which I believe belongs to the family's patriarch. Framed certificates of stock ownership as early as 1930s, these papers exist way before World War II. One of our colleagues was assigned to this room. I don't know what happened but come night time, we discovered that they transferred to another room. My friend who has this talent of seeing extraordinary beings also said something that frightened us more. Our group of 6 colleagues slept in another room, which I failed to take photos. Fail!What I instead have in my camera is a compilation of other interesting pieces. The blue pair of Bally is to die for! It may not be clear from the photo but I was treated to a feast of Nine West, Yves Saint Laurent and more signature brands. 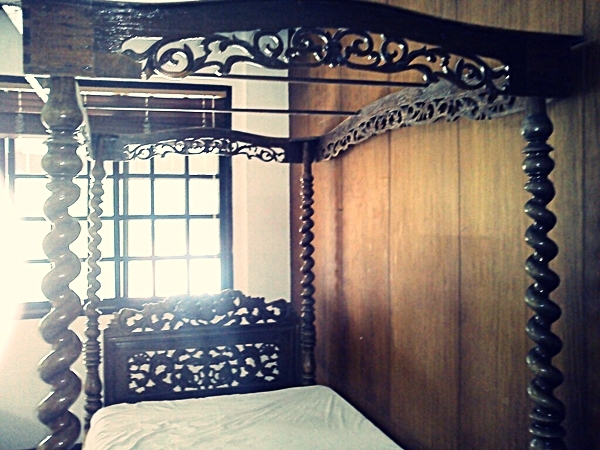 Casa Corazon's ancestral house is a priceless treasure. However, allow me to make some comments about the place. I don't know if it's true, but I heard from a colleague that the resort's management doesn't really accommodate guests in the ancestral house. So I guess we were privileged to be given a three-day stay. I hope the resort's management will not negatively take my feedback. As a guest, I believe that they should have housed us in their regular family rooms. More than the eerie and creepy atmosphere that haunted us for days, the ancestral home will be better off if it remains to be preserved. In the morning, taking a bath also became a burden because of the weak flow of water. In order to address this problem, I made a little sacrifice by taking a bath before I sleep. Unfortunately, my body is not used with this practice. This explains the colds and fever I have to endure as I'm typing this post. On the last day of our retreat, our Chaplain informed us on how we ended at Casa Corazon. The resort's owner, being an alumni of our school, accepted what our school's budget can afford. Thank you Sir! May your good heart be continuously blessed. At some point, this prevented me from complaining. However, I believe that we are still customers. In addition, I believe in the advertising power of "word-of-mouth." Every great service rendered is like news that possess its own wings to reach everyone. Another major concern during our stay was the quantity of food served to us. I know I shouldn't complain. One of my colleagues talked with one of the food servers and we were surprised to discover that the entire caterer was from Manila. They were just outsourced by Casa Corazon to feed us. This may not be Casa Corazon's direct fault but the caterer has a lot to improve. The servings, the cleanliness of the utensils and the taste of some dishes can still be made better. The small houses you can see are the family rooms I'm referring..
My blog post for Casa Corazon is not yet done. The place is so abundant to be squeezed in one post. Expect more pictures and experiences on my next posts. Fore more information about Casa Corazon, visit their website and Facebook account. Ouch. I hope your future continued post helps us readers to feel better about your retreat, Diane. It looked lovely anyway, didn't it? Well I love the look of the retreat!!! What a beautiful place to get have a retreat! I enjoyed the tour Diane. Wow Diane! What a splendid house with so much history! The vintage books are fascinating and the shoes...omg! I would love to take a dip in that pool (it is so cold here). I'm sure you enjoyed this retreat! I loved reading about and seeing this ancestral home. One thing I did not understand. Did your friend, the one who sees extraordinary beings, tell you he saw something or someone strange in the room? Is that why you all stayed in another one. Could have been ghosts from the family's past residents. I know you loved seeing all those shoes! The pool looks lovely. I do think you would have been happier staying in regular rooms and just visiting the house's historical rooms. The water situation would have bothered me too. Can't wait to see more pictures. So did the photos creep you out in the living room? ;P I think it's neat that you had the opportunity to stay in the ancestral home, but I hate that you were so inconvenienced with the water issues. Very interesting post! Hi Diane! Oh, what a wonderful house! I love touring historical places and I'm sure you really enjoyed it.